Truffle is the most popular ethereum development framework. If you worked with it before, you might have used the “truffle migrate” command to deploy your smart contracts. If you use the command without thinking what it does, it might be worth revisiting it to fully understand what it is doing. 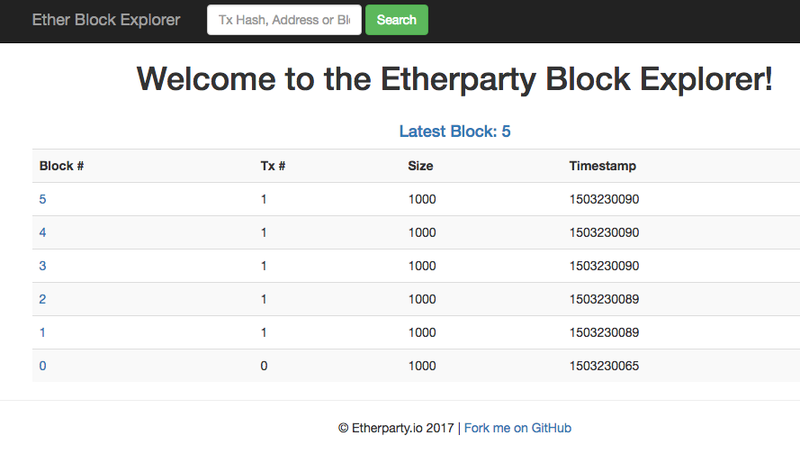 If not done already, install ethereum testrpc, truffle and a simple eth explorer. Simply follow the steps below if you are new to ethereum development. Let us install and start testrpc. In another terminal, install and start ethexplorer. Go to http://localhost:8000 and you should see block 0 only. Its time to install truffle with the metacoin example and deploy it to the testrpc network. Let us run through what “truffle migrate” is doing one step at a time. It started by compiling ConvertLib.sol, MetaCoin.sol and Migrations.sol under the contracts folder into the build folder. We could have done this step first using the “truffle compile” command. Since we didn’t do it, “truffle migrate” did it for us. Next, it deployed the 3 contracts to the testrpc network. We got the transaction and contract addresses for each contract deployed. The number of transactions could be verified in ether explorer. In testrpc, there is no mining. So each block holds 1 transaction only. We saw 5 blocks, meaning 5 transactions. Wait, why 5 transactions? Looking at the console output carefully, there were 2 more transactions for “saving migrations” to the network, ie tx id 0xe2807a60304aea783a1b5a56eb4968a53ae4b8f58f97f55bcbd44d401cb9186c and 0x8e7d508dd570d6aca60d1cc3d7f5a6c3ea906a9e3399cfb7755b267cf4b36312. You could verify that they happened in block 2 and 5 respectively. 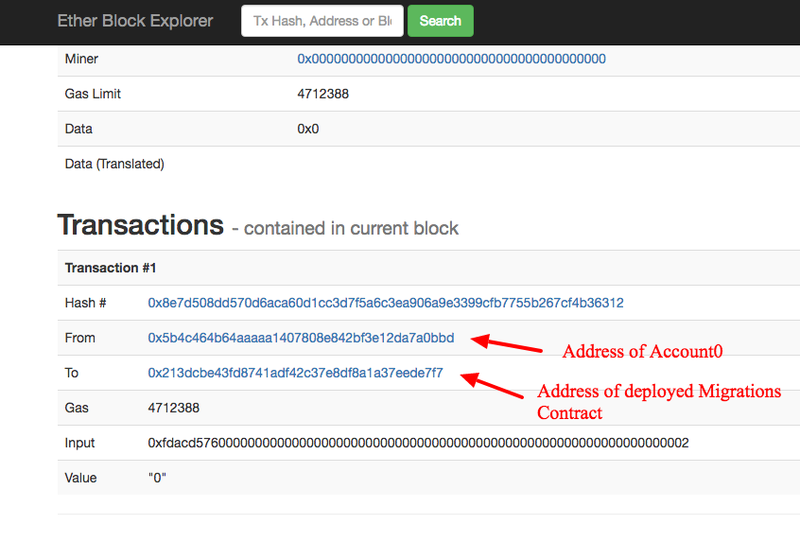 Block 1, 3 4 were the actual deployment of the 3 contracts. You (account holder) paid gas to change the state on the Migrations contract. So what exactly did you do? The Migrations.sol contract is required by the “truffle migrate” command. Every time a migration step is completed successfully, “setCompleted” function is triggered to update the last_completed_migration number. In this case, “setCompleted” was ran 2 times because there were 2 deployment files in migrations folder, ie 1_initial_migration.js and 2_deploy_contracts.js. They were executed in sequential order. We could verify that the value of last_completed_migration was step 2. While you could redeploy everything again easily using “truffle migrate — reset”, it might not be practical to keep doing it in the real network simply because every deployment requires gas(ether). Practically, running truffle migrate now gave different results. The Migrations contract knew the last_completed_migration was 2 and would not run step 2 again, so it executed only step 3 and skipped the first 2 steps. What if the Migrations contract is itself upgraded? the last_completed_migration number could be transferred over to a new Migration contract using the “upgrade” function within Migrations.sol. There has been arguments whether it is necessary to deploy a separate contract to the network simply to track number of deployments. There should be ways to track it within truffle and possibly something for the truffle team to look at in the future. Better still, decouple Migrations.sol from the “truffle migrate” command so that people who chooses not to use it can do so. Founder of Whale Tech. Blockchain Developer and Technologist.